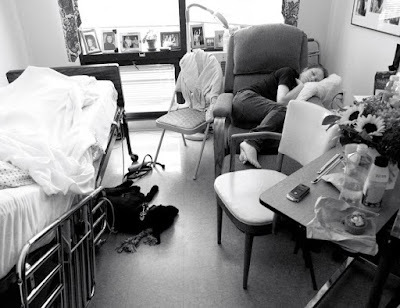 A high quality hospice provides the best end of life care – something that I have documented in JAMA 2004 and Journal of Palliative Medicine 2015 articles. However, an important caveat is “high quality". Both my mother and great aunt died on hospice service, for which I am very grateful for the excellent hospice care each received. So why have I concluded that visits by professional hospice staff matter in the last two days of life? First, I don’t expect that 100% of hospice patients dying on routine home care (RHC) are visited in the last two days of life. Rather, I am concerned by the patterns that we observed in the analysis of FY 2014 administrative data: 1) Blacks were 30% less likely to get visits; 2) nearly one in five persons dying in a nursing home did not get a visit; 3) one in five dying on a Sunday did not get a visit by professional staff; 4) 8% of hospice programs that had at least 30 patients who died and were discharged on RHC did not provide any visits by professional staff in the last two days of life; and 5) finally the striking, geographic variation. Previously, I have been an author in a study that reported Blacks had more unmet needs for pain and bereaved family wanted more information about pain management. This lack of visits raises an important concern. Historically, nursing home as site of hospice care has lower reported ratings of the quality of care –so the lack of visits may be a concern. My mother died in a nursing home – I am thankful for the nurses, social worker, and volunteers who visited her in the last days of her life, even though I as physician was at her bedside for most of the time in the last days of her life. Second, a concern that has been mentioned is that family don’t want these visits. Perhaps, this should be a focus of future research. My experience with focus groups and in-depth interviews with families attest to the importance of these visits. For example, the words of a bereaved family member expresses this concern eloquently. My best educated guess is the observed variation is not being driven by family preference being different in the state of Rhode Island vs. Wisconsin. Something that I have said about feeding tube insertions and patterns of hospitalizations that I have called burdensome transitions. Why not focus on visits by nurses’ aides, bereavement staff visits, and those by spiritual staff? The fact that we did not report those visits is not meant in anyway to under value the importance of those staff. Rather, our focus was to examine whether professional hospice staff who are responsible for the plan of care are reassessing patients at this critical time period. The issue with rural hospice programs is important. I think that we need to test telemedicine intervention in hospice not as a means of saving money, but ensuring dying persons and their family receive the needed support. I agree that visits in the last 2 days of life is a population based quality measure that should be examined in the context of national bench marks or expert opinion. If I was the CEO of a hospice program that made no visits by professional visits in the last two days of life, I would be concerned. Ultimately, I would look at the Consumer Assessment of Healthcare Providers and Systems hospice survey (CAHPs) Hospice results of my organizations. When I examined this in a small number of hospice programs as part of the validation of the Family Evaluation of Hospice Care (FEHC) survey, we found differences in overall rating of the quality of care and family report of concerns with training in pain management. Time and time again, as health service researcher, I have questioned our current volume based financial incentives that has resulted in late referral to hospice, more stays in an ICU in the last 30 days of life, and multiple hospitalizations in the last 90 days of life. While hospice payment reform cuts RHC payment post day 61, the service intensity adjustment provides incentives for more care. Working as hospice medical director for nearly 20 years, I believe that incentives that result in more visits by an RN and /or MSW in the last week of life will improve the care of the dying. However as a health service researcher, I think it is important to examine whether this policy is effective based on interviews with bereaved family members as well as patient reported outcomes of symptom control in the last week of life. This will be probably be one of the few times that my main hypothesis is that more is better. I truly hope it is. As a Fellowship-trained Palliatist and Hospitalist, the quality vs quantity issue is a constant topic. It is important to assess both, in context. For example, the common nurse-driven, physician-endorsed tradition of escalation of morphine is a questionable practice, just as this bereaved family member experienced. Escalation of care may not necessitate escalation of dose or of visits. This speaks to quality, and of best practice training needed in the Hospice realm, which has largely gone unexamined in the step-child arena of Hospice, until recently. My observation is that when quality is addressed, quantity mandates may recede. Thus, as a nation, we must decide that this has become a priority, i.e. to invest in quality, and begin to view volume-based, low quality, uneducated, complication and readmission-generating traditions as, ultimately, too costly: to individuals, to our culture, for 'payors', as ultimately, all of 'us' pay the price, on so many levels.